Through 59 years in radio Don Thurston always placed community service first for himself, his stations, and his industry. Donald A. Thurston was a pioneering radio station owner in the Berkshires, a radio craftsman, a dedicated businessman, and a highly respected leader in his community. He was born in Gloucester in 1930 and received his FCC Broadcast license after graduating from the Massachusetts Radio and Telegraph School in 1949. He began his broadcasting career in 1949 at the age of 19 as an engineer at WTWN in St. Johnsbury VT. From 1952-1960 he built and managed WIKE in Newport VT. In 1960, he came back to Massachusetts to head operations at WMNB 1230AM in North Adams, later renamed WNAW. In 1968, he added WSBS in Great Barrington to his media properties. By the mid-1970s he also owned stations in Connecticut. Thurston ran in the Republican Primary for the US Congress seat vacated when Silvio Conte passed away. He was also active in national organizations representing the interests of broadcasters, including as Chairman of the Board of the National Association of Broadcasters and Chairman of BMI. 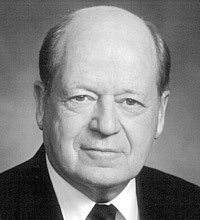 In 1980, he received the NAB’s Distinguished Service Award. He was also a charter inductee into the Vermont Association of Broadcasters Hall of Fame. Donald Thurston passed away in 2009 at the age of 79.